Protocol:NT-Ring.IGMP v1/v2.GVRP.SNMP v1/v2/v3 .DHCP Client.TFTP.SMTP.RMON.LLDP.HTTP.SSH.Telnet.SNTP Server/Client,. Switch function:NT-Ring.POE+.RSTP.SNMP.QOS.802.1Q VLAN. Port Trunking.Static multicast filtering.Bandwidth management.Broadcast storm.Port traffic statistics.Online upgrade.Upload and download profiles,User name login system, etc. NT-Ring: Support Single, couple, Chain, Dual homing etc. ring network structure. 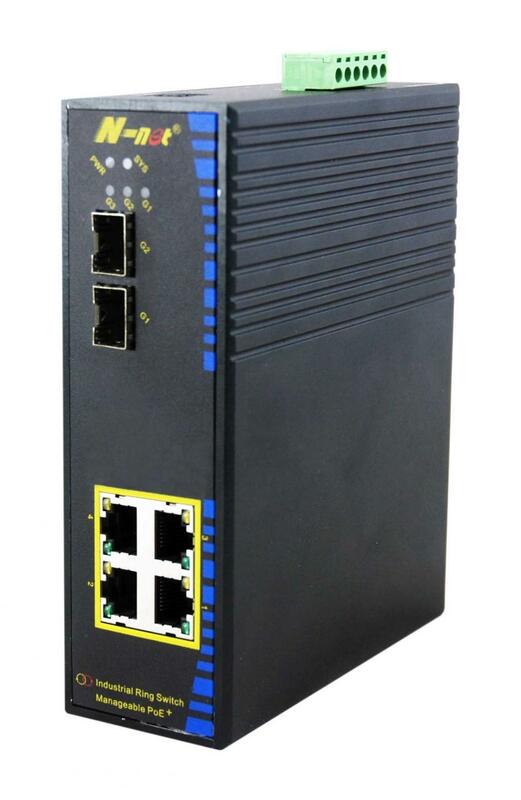 Fast port:1X4 10Base-T/100Base-TX adaptive,RJ45 port. Gigabit port:1X2 1000Base-X SFP fiber port. Interface indicator:The green light is 100M,Off is 10M. Yellow light is light and blink for port link-up status,Transmitting and receiving data,Off is link-down status.